Ready for elegant island living in a relaxed atmosphere? Have it all in this beautiful 3rd floor West end unit with over-sized wraparound balcony that overlooks the beautiful white sand beach and outdoor swimming pool. Recently redecorated, it has nine foot ceilings and tiled flooring throughout (except the carpeted Master bedroom). Keypad on front door with personal code means not having to keep up with keys and more time enjoying the beach on your vacation! Approximately 1600 s.f., includes spacious living room, dining area, full kitchen, 3 bedrooms / 3 baths and comfortably sleeps 8 with a queen size sleeper sofa. The large living room features a full view of the beach and Gulf, queen sleeper sofa, love seat, sitting area, and TV with DVD and surround sound. The dining area has a full size dining table with comfortable upholstered dining chairs seating 6. There is also additional seating at the kitchen island, peninsula, and on the balcony. The huge, fully equipped kitchen includes microwave oven, convection toaster oven, dishwasher, disposal, refrigerator w/ice maker and filtered water, toaster, coffee maker, blender, dishes, cookware, glasses and utensils. Also includes plenty of large serving dishes for entertaining. There's a convenient peninsula with stools, a portable island with seating for two, full size washer and dryer, and a full size ironing board and iron. The master bedroom has a king size bed and private bath with large soaking tub. The second bedroom has a queen bed and the third bedroom has two twin beds. 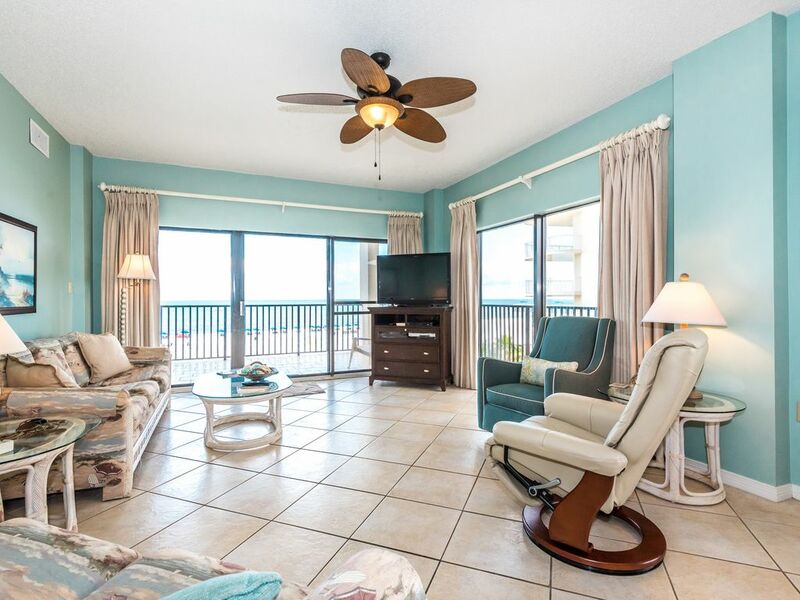 All bedrooms have sliding glass doors to wraparound balcony for Gulf front views. Twin bedroom has color TV and VCR, while the master bedroom has TV and blu-ray w/ smart streaming, and queen bedroom offers a flatscreen TV. All three bathrooms are spacious. The huge Gulf front balcony overlooks the pool, has a large table and chairs, perfect for taking in the sights and sounds of the Gulf of Mexico. Two elevators quickly take you down to enjoy sunning by the outdoor pool on the beach front, or escape from the sun on those chillier days at the indoor heated pool. (Both have restrooms conveniently located for guests.) Private boardwalks lead to one of the largest beach areas on the coast where umbrellas and padded lounge chairs are available for rent. Outdoor showers are conveniently located at each boardwalk for leaving the sand on the beach! The fitness room is equipped with a treadmill, stationary bike, weight equipment and stair machine. After your swim or workout, reward your self with a relaxing dry sauna. Elevated, lighted tennis courts are available to you above the covered parking area. There is also an area to grill steaks and any fish you may have caught. For those with their own boat, there are convenient accommodations directly across the street. The Palms is situated in a prime location, just a few short blocks to three large grocery stores, four pharmacies, restaurants, movie rentals, spas and shopping. The Tanger Outlet Mall offers great retail therapy with over 120 brand name stores for those occasional rainy afternoons. Swim with the dolphins at the new Wharf. It also has an amphitheater for regularly scheduled concerts, more shopping and a movie theater. Perdido Pass offers a new area just for fishermen. Marinas, glass bottom boats, chartered deep sea fishing, golf (big boy and miniature), Alabama Birding Trail, amusement parks and water theme parks are all just a few short minutes away. If you are looking for a romantic getaway, a family retreat, or respite from the cold winter, you will love our condominium at The Palms as your next vacation choice. We assure you there will be no disappointments! We will strive to make your stay comfortable, stress free and memorable. We are a new listing on VRBO, and look forward to establishing many long standing relationships. Thanks for looking. THIS IS A NON SMOKING-NO PET UNIT! Fitness center with Treadmill weight equipment, Stationary Bicycle, stair stepper. Very nice condo equipped with everything you need. The beds are so comfortable. Owners are a delight to rent from, always available to offer any help if needed! Wonderful vacation spot and family time! Wonderful vacation spot and family time! My family and I completely enjoyed the Palms 316 condo. It was a welcoming clean well-stocked condo with an incredible view of the beach and the swimming area as well. We hope to come back to this specific condo again. Thank you for your review of my property Just let me know when you want to come again. This was a wonderful vacation for us. The property is easily accesible and the beach is beautiful. The owner was so easy to work with and kind. We would definitely stay here again! Enjoyed this condo as always. Great access to the beach and pool. Always clean and love that it has three bathrooms. Thank you for your kind review of our condo. And thank you for choosing it for your vacations. Had parking lot drainage problems and elevator problems but both were fixed quickly. I was a bit alarmed at first with no staff on duty as to how to report elevator issue. It was a little scary taking my husband down 3 flights of stairs with his walker. But by the time we returned from doctor appointment elevator was fixed. Pools were kept clean and were lovely to use. My family has returned to this condo for the third time this year. The kitchen is well equipped with all the utensils needed to cook at home. We also love the fact that there are three bathrooms. The grand kids loved the wrap around balcony and I enjoyed the pool being just below us. The owner is great to work with and we look forward to coming back each year.